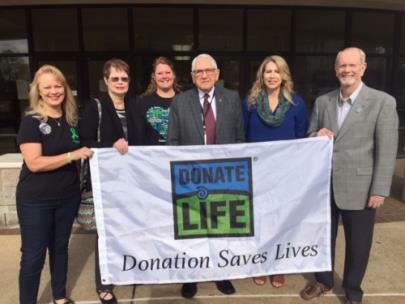 In recognition of Donate Life Month, Hamilton County Clerk Bill Knowles is encouraging residents of Hamilton County to consider giving the gift of life by being a donor. The month-long celebration honors the generosity of organ and tissue donors and their families and commemorates all transplant recipients in the United States. “Spring represents a time of rebirth and new beginnings and for many individuals who have received the gift of life through organ or tissue transplants, April holds a special meaning as Donate Life Month,” Mr. Knowles said. Currently over 3,000 Tennesseans, including 77 people in Hamilton County, are waiting for a lifesaving organ transplant. Nationwide 113,000 people are on the waiting list. Unfortunately, 20 people die waiting because of the critical shortage of organs. Tennessee County Clerks play a key role in promoting the gift of life message by offering residents the opportunity to donate a dollar when they renew their car tags every year. Those dollars are used for the creation and distribution of educational materials for the public and school-based programs. Mr. Knowles was one of the founders of the successful “Donate A Dollar” program. Over the years Hamilton County consistently ranks in the top two counties of monies raised. “We are pleased to be a part of saving lives through this program. I want to thank the citizens of Hamilton County for their continued generosity and support of organ and tissue donation,” Mr. Knowles said. The Tennessee County Clerks Organ Donor Awareness Foundation was launched in 1996 to support organ donation education in Tennessee. The foundation works in cooperation with non-profits Tennessee Donor Services and Mid-South Transplant Foundation to educate Tennesseans on the importance of registering to be an organ and tissue donor. Since its inception, the foundation has raised over four million dollars.